From the moment i saw this list i knew i would have trouble with it. 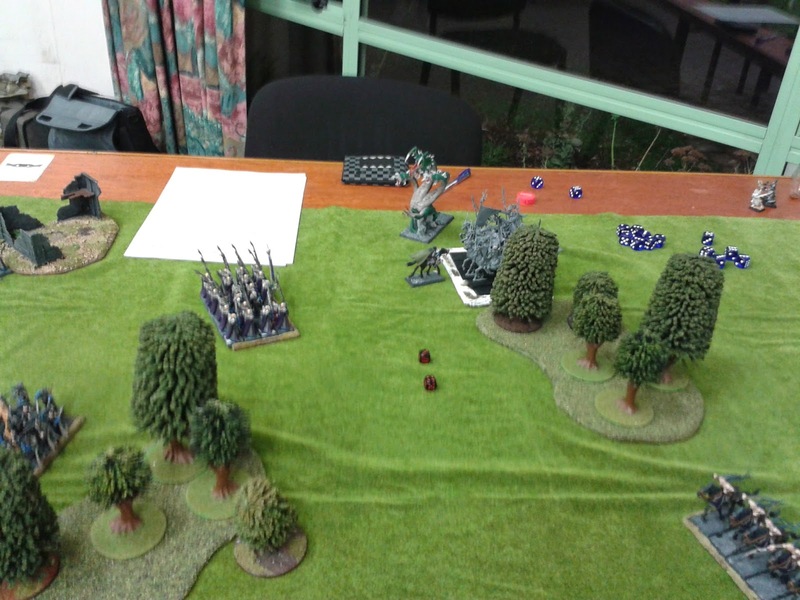 As i have said before Wood Elves have a strange phobia of armour, and the best way to beat them is too out shoot them. 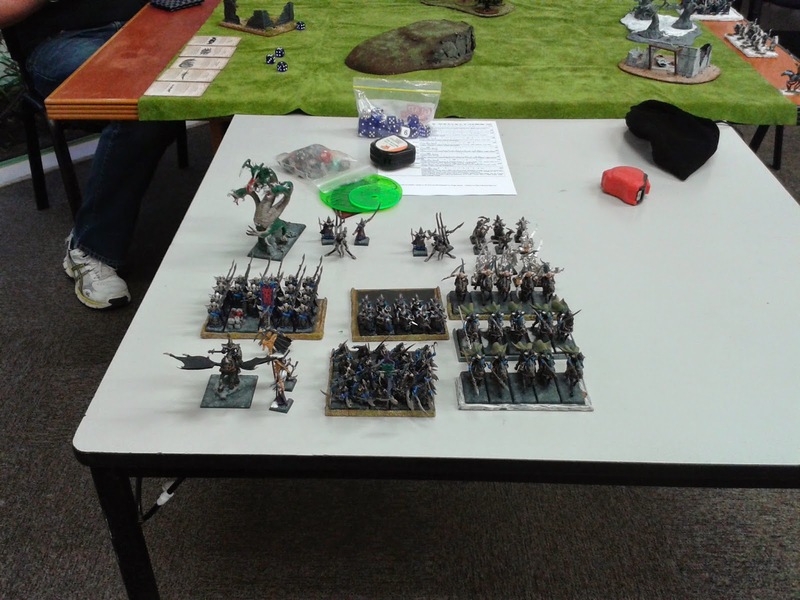 That being said my list wasn't without its bite, 10 Wild Riders can spoil anyone's day and the Wood Elf Archers, whilst not being as numerous as their Dark Elf counter parts, out matched the Dark Elf ranged units for accuracy and range. Before i get into the battle proper i just want to write a quick paragraph about my plan. The general plan with this army is to stick all my characters ,bar the mounted high mage, into the Eternal Guard unit and then stick that unit in my forest. I would then proceed to lure my enemy to that forest and have the central combat there where i would have all my advantages. It turns out that this plan would work better if i had more archers in my list and it relies on my opponent not out shooting me. Nick had the table set up and ready to go before i got there. Nick also had his army set up all proper like, so i felt it was my duty to take a picture. place my Eternal Guard with characters in the forest, with the High Mage and Glade Guard directly behind the forest (Thank you Trueflight Arrows). The forest had a unit of Wardancers on each flank with the Wild Riders waay off on the right along with the small unit of Waywatchers, finally the bigger unit of Waywatchers took up a position at the base of a hill near the Eternal Guard. 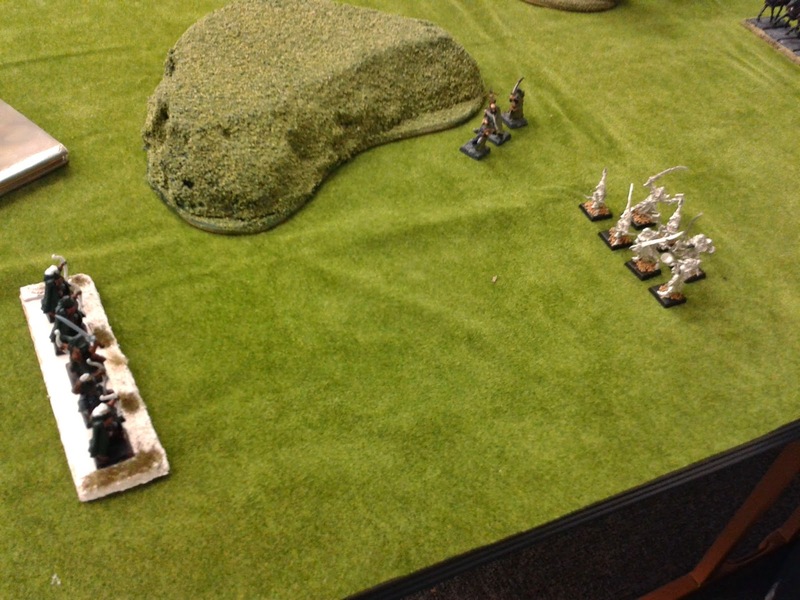 Nick deployed his Doomfire Warlocks and Shades on the right flank facing down the Wild Riders and Waywatchers. 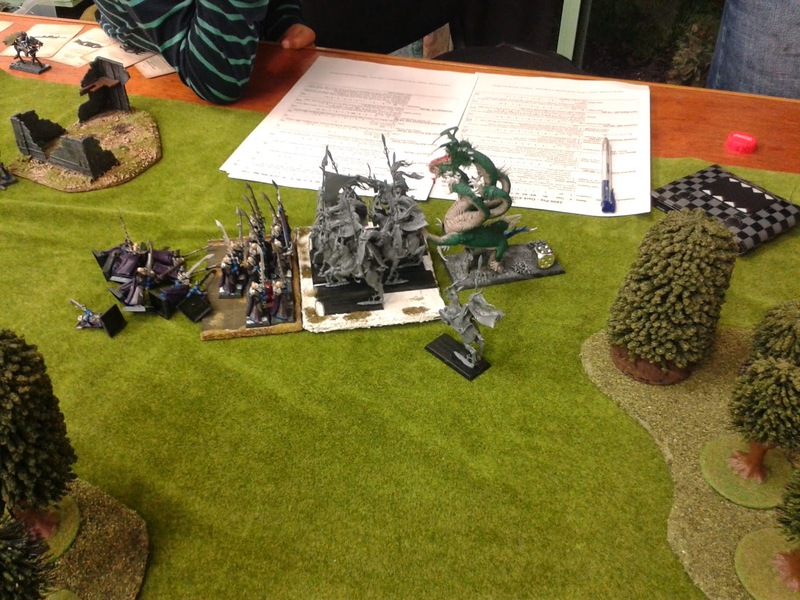 In the centre he deployed his Kharibdyss, Executioners, Corsairs (with BSB and Sorceress) Dark Riders and a Repeater Bolt Thrower. 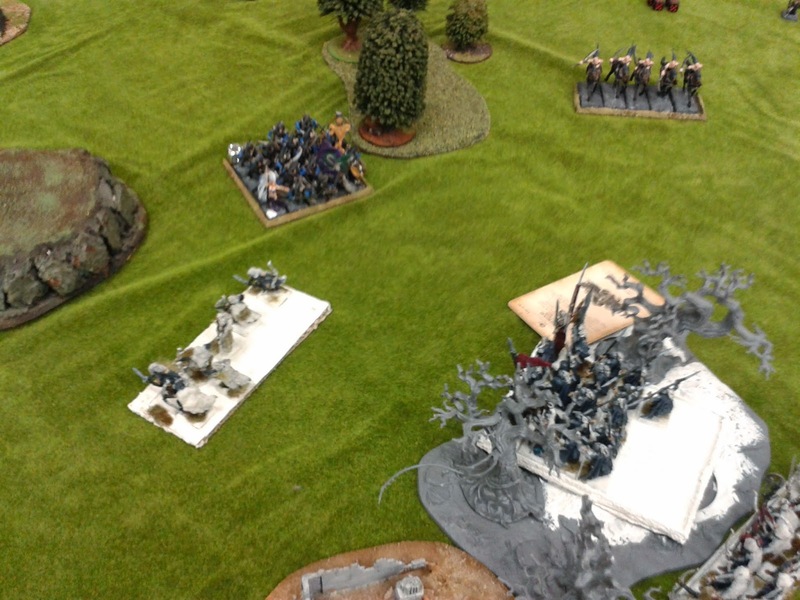 On the Left Flank he placed the final Repeater Bolt Thrower and the unit of Repeater Crossbows with Assassin along with the Dreadlord on Pegasus. 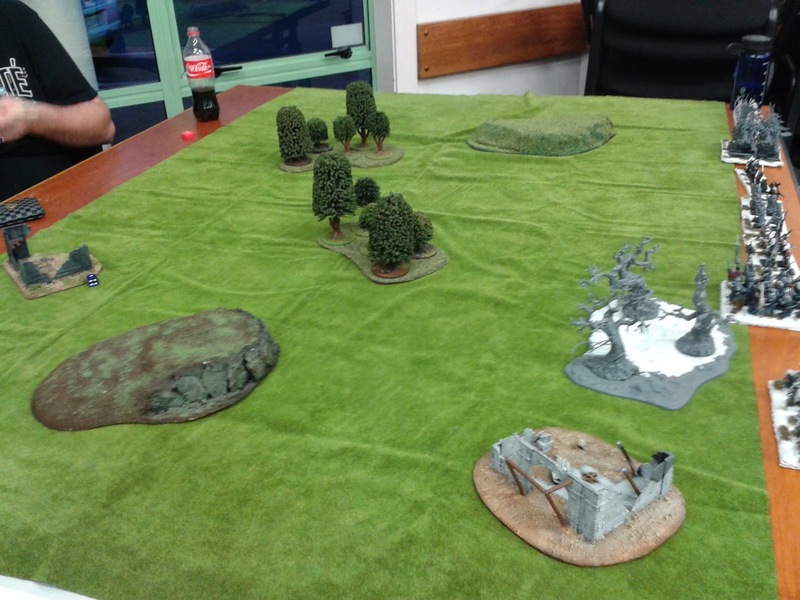 I won first turn and opened with pushing the Wardancers on the left flank towards the Bolt Thrower and the second Wardancer unit towards the centre of the Dark Elf line. The Wild Riders advanced cautiously. The bigger unit of Waywatchers turned around to face the on coming Dark Riders, and the smaller unit faced down the Shades. The magic phase opened up with me double sixing Throne of Vines, failing the 2+ miscast protection and loosing 3 Eternal Guard as a result, i then cast Earth Blood on the same unit giving everyone there a 4+ Regen save. 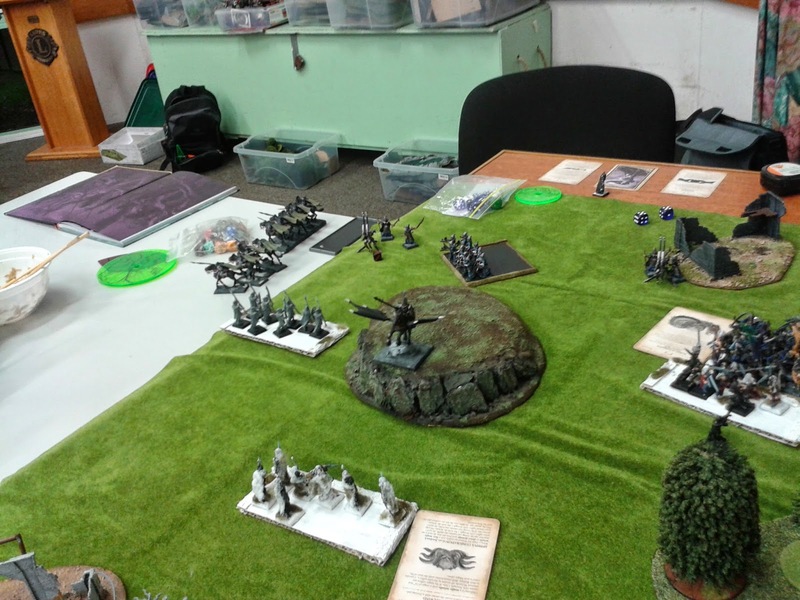 The shooting phase opened with a bang, the 20 Glade Guard wiped out one of the Dark Shards with the Waywatchers reducing the other unit to just one model. 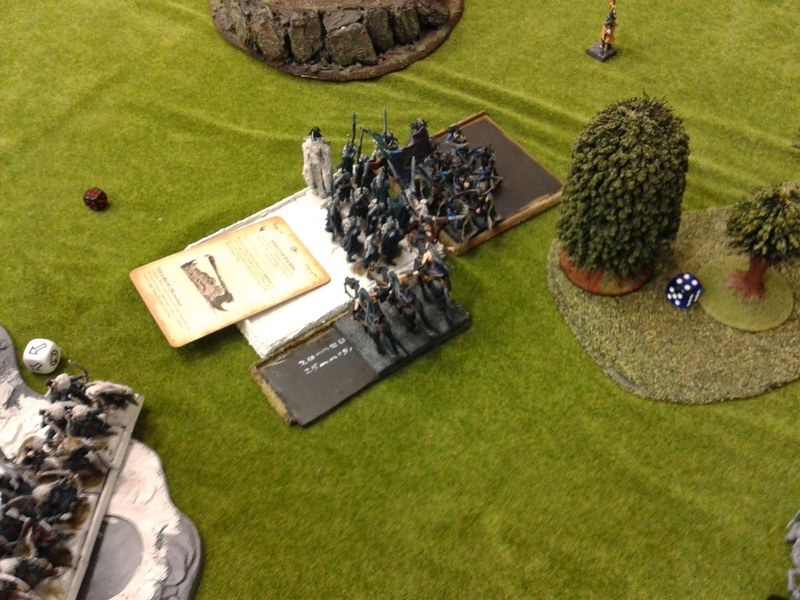 The second unit of Waywatchers killed about 3 shades and failed to panic the unit, and so grimly awaited their fate. 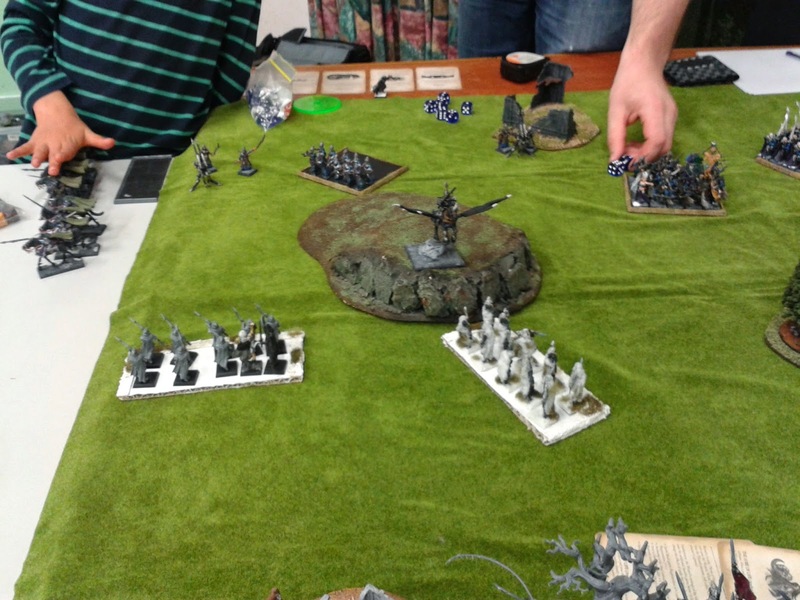 Dark Elf turn 1 saw trickery! 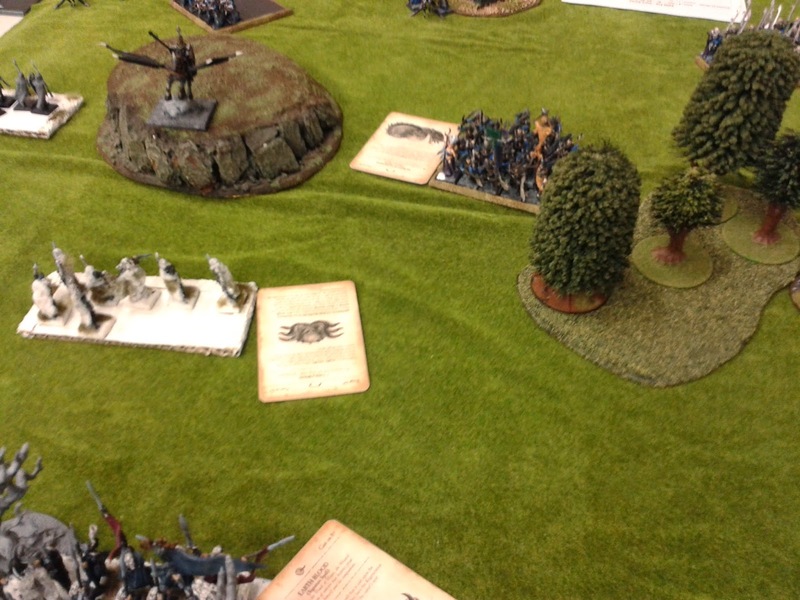 Nick to his last remaining Dark Rider and placed it directly in front of the Wild Riders in order to try and set them up for a counter charge next turn. The Dreadlord and his Steed took up a imposing position on the hill top looking over the big unit of Waywatchers. The Doomfire Warlocks took up a position harrying the flank of the Wild Riders and the Executioners and Kharibdyss formed up for a counter charge on the Wild Riders (after they overran after killing the Dark Rider). In the Magic Phase the bigger unit of Waywatchers was hit by Chillwind and lost 2 members, and Power of Darkness was double sixed at the cost of the lives of a few Corsairs. 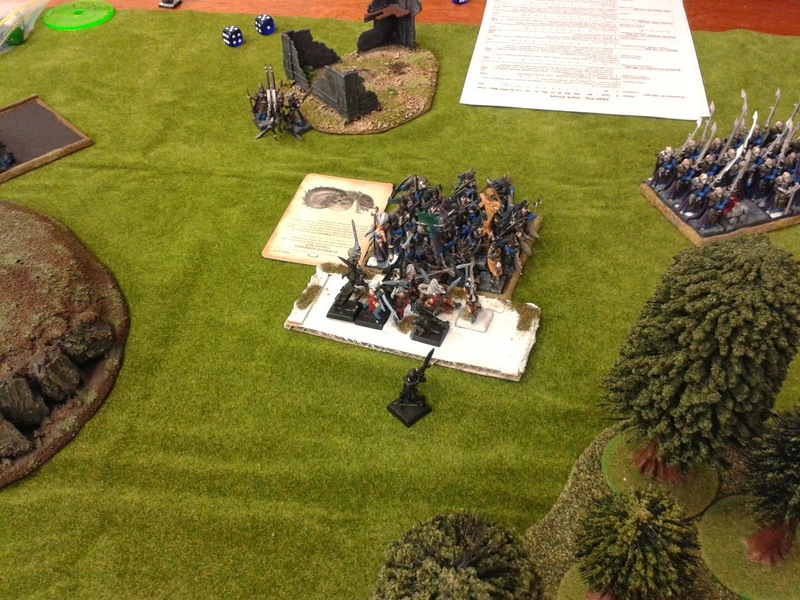 And finally the shooting phase saw the smaller unit of Waywatchers run away after being shot at by angry Shades. 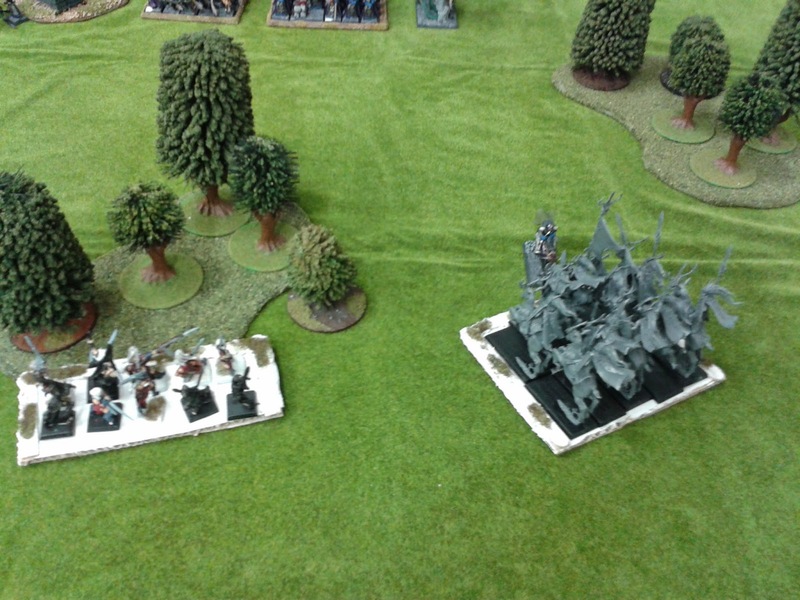 My turn 2 started aggressively with my central Wardancer unit charging into the Corsairs and my Wild Rider unit not charging the lone Dark Rider who would have spelled their doom. 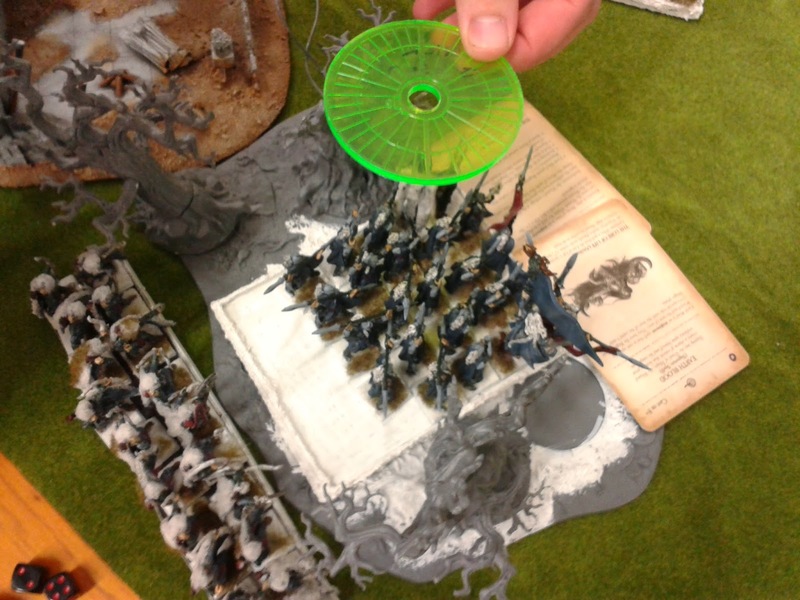 It also saw the other unit of Wardancers failing to charge the Bolt Thrower. 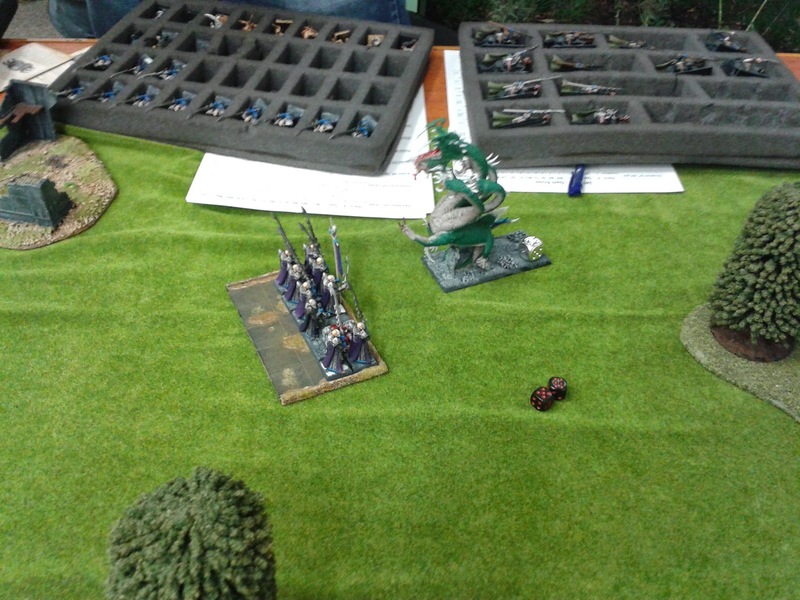 In the non charging side of things the Waywatcher unit pulled back to face down the Dark Elf and his faithful steed. In the Magic Phased a magicked up a solution to the Wild Rider/ Dark Rider conundrum. 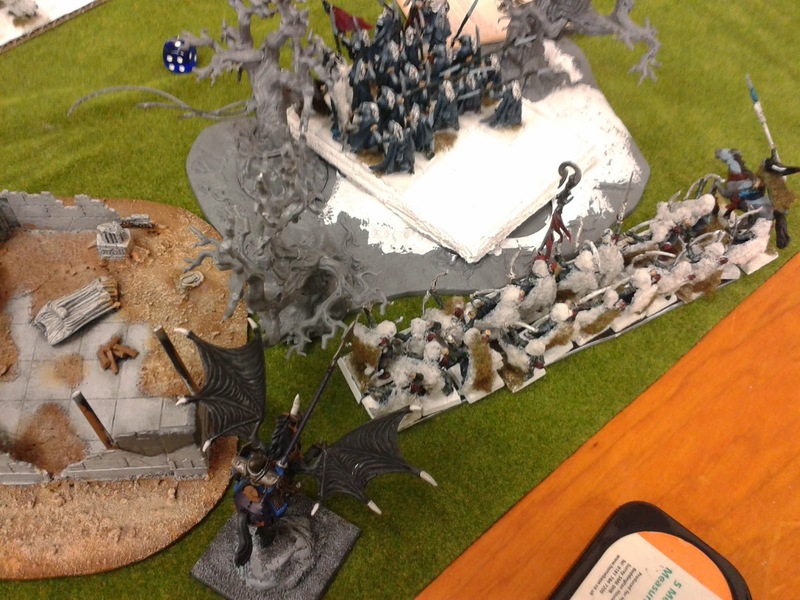 I cast a boosted Walk Between Worlds on the Wild Riders and speed them up to face the flank of the Kharibdyss. I also hit the Dreadlord with Arcane Unforging and took a wound off him in spite of the Cloak of Twilight (take that high armoursaves!) i then went on to destroy the Dragonbane Gem the Dreadlord was carrying, but that was the only downside to the magic phase. 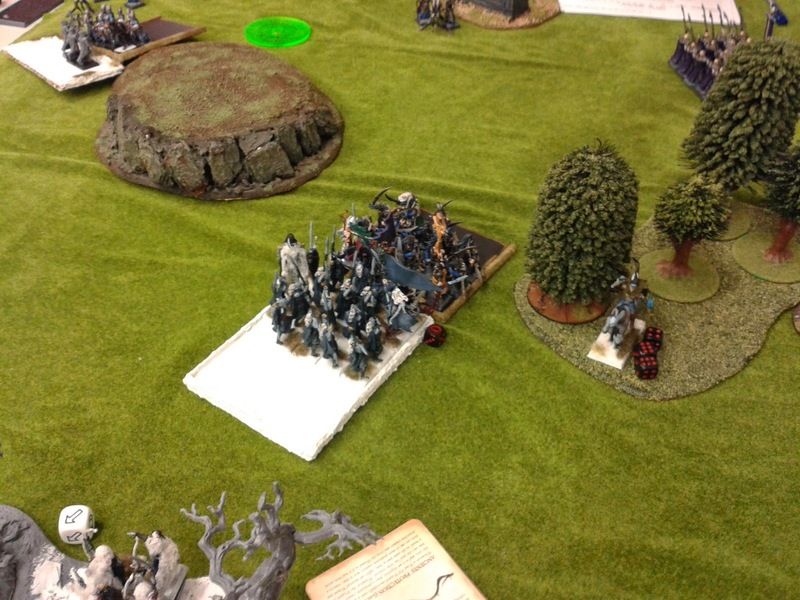 In the shooting phase both the Glade Guard and the Waywacthers took aim at the same Dreadlord but to no effect. No effect sums up my Combat Phase as the Wardancers were unable to killing blow either the BSB or Supreme Sorceress despite having about 5 attacks on each of them. The Wardancers did nothing and were run down for their trouble, thus began a long string of fluffed attacks for both armies. The Dark Rider strikes again! Nick opened his turn with more infernal tricky. He sped the remaining Dark Rider directly in front of the Wild Riders, again. This time around i was confidant that i could overrun into the Executioners but it wouldn't be perfect. Elsewhere the Dreadlord sped behind the Glade Guard and leered at them creepily, at least thats what i assumed he was doing. 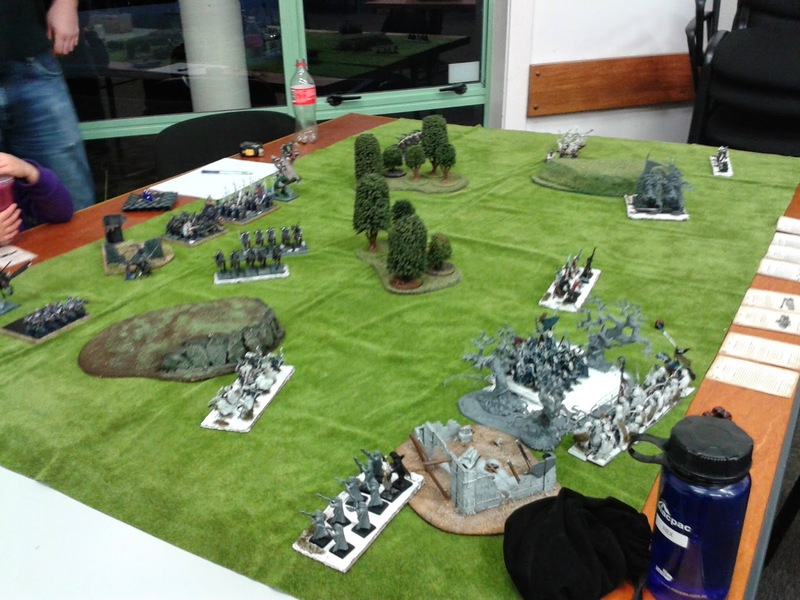 Meanwhile the Crossbows advanced towards the Wardancers and the Corsairs advanced towards the Eternal Guard with the Doomfire Warlocks closing in on my Forest Bunker. the magic phase was utterly unproductive but the shooting phase did see my Waywatchers reduced to 4 models, they stayed on the board.....just. 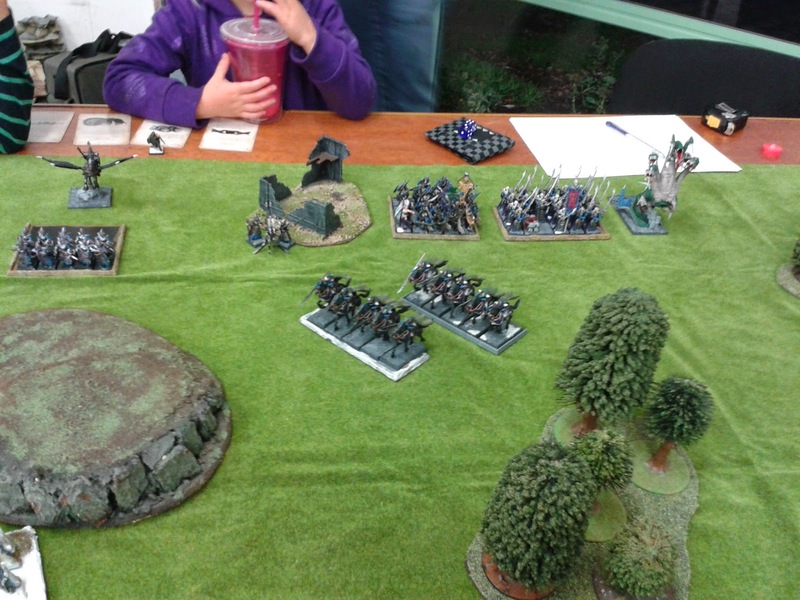 Turn 3 was charge time, the Wild Riders went into the Dark Rider, the Wardancers into the Crossbows and the Eternal Guard into the Corsairs. 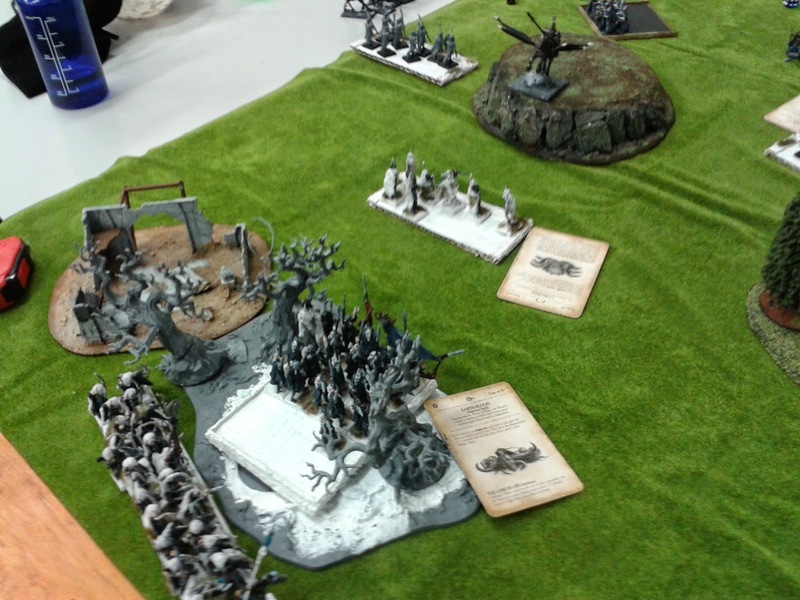 It also the Waywatchers move to face down the Dreadlord and finally i hopped my mage out of the Glade Guard into the small wood by the Corsair and Eternal Guard fight. In the Magic Phase i used the ever useful Walk Between Worlds to turn the Glade Guard to face the Dreadlord and then something certainly did happen in the Shooting Phase, the Glade Guard opened fire at the Dreadlord and got through exactly 2 wounds on the Dreadlord who had a 3+ Ward Save against shooting so i was not expecting a great result but lol and behold the Dreadlord failed both and died, thats what you get for starring down a Wood Elf Gunline. The Combat Phase was inconclusive, with a duel going nowhere between the Shadowdancer and the Dark Elf BSB despite the Killing Blow dance, and the Wardancer/Crossbow combat went poorly with the Assassin popping out and scything down all but 3 Wardancers with no kills in return. The one good thing was the Wild Riders over running into Executioners, finally they would have something decent to kill. 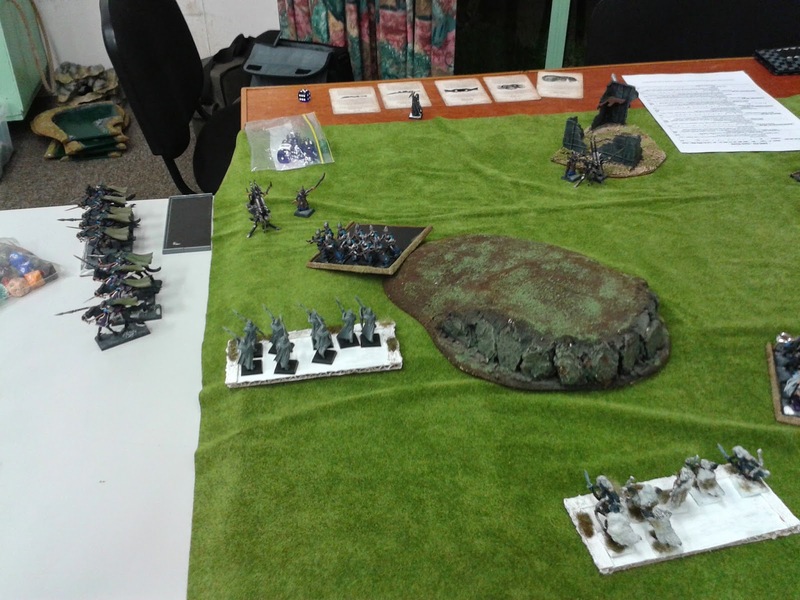 Dark Elf turn 3 saw the Doomfire Warlocks charging into the flank of the Eternal Guard and the Kharibdyss rear charged the Wild Riders. In the remaining moves department the shades moved up to pepper the mounted mage. The Magic phase was a buts for Nick as i double six dispelled his Souldblight that he was trying to cast on my Eternal Guard and in the Shooting Phase the Shades managed to remove a single Protection Counter from the mounted mage and the Waywacthers were fled off the board after suffering hits from the Bolt Thrower. 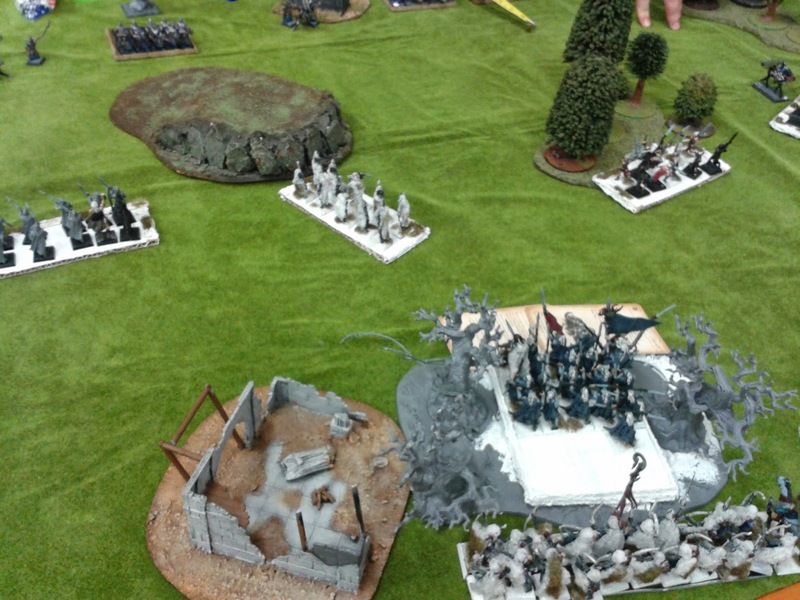 In the Combat Phase the Wild Riders wiped out 10 Executioners but were destroyed in return, and the Eternal Guard/Corsairs/Doomfire Warlock combat ground on with neither side giving but it did see my BSB fall to Doomfire Warlocks and failed Armour Saves, oh and the Wardancers died to no one's surprise. 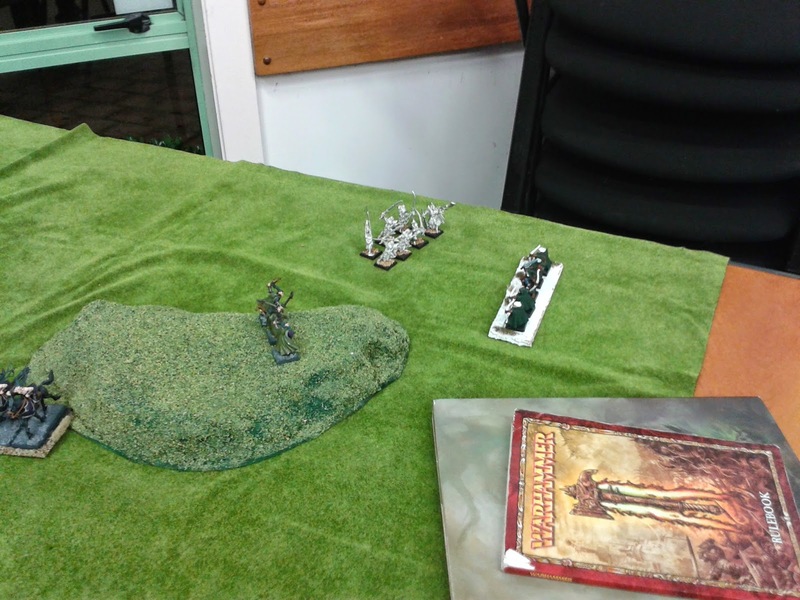 Wood Elf turn 4 was the final turn if the game as both myself and Nick and a Roleplay to do. Not much really happened here so i will briefly sum up the turn. I killed the Shade unit that had been weakened by the Waywatchers earlier and my Shadowdancer finally killed the Dark Elf BSB with the only killing blow hit i managed to land in the whole game.In the end Nick had 47 more points than me so it was a draw, again. I would like to thank Nick for the incredibly close game. So how do i think things went? Over all i was happy with both the armies performance and mine. I really needed to finish off that Dark Rider thought as he was a constant thorn in my side and well done to Nick for being able to use him in that way. I have made a few changes to the list, notably the Wild Riders are gone in favour of an other unit of Trueflight Glade Guard, and the second unit of Wardancers have been replaced with a unit of Warhawk Riders. I've got to admit, I'm a little sad to see the Wild Riders go. They're your only combat unit but, then again, Wood Elves. Congrats on the draw though. It seemed like your dice were really poor with only one killing blow but so many chances. Se La Vie. The Wild Riders have actually be replaced by a unit of 6 Treekin. The list has undergone a big change and its all focused on forcing the opponent to fight me where i want them to fight (i.e. In a forest). Hopefully it works next time. my thoughts are dont invest heavy points in the one unit of wild riders. two units of 5 might look weak on paper, but if used right they can shore up certain areas of the battlefield like flankers, and hit the flanks themselves. just my thoughts. Given I watched 5 kill 9 of my Silverhelms in one round, yeah I dont think you need to go much bigger. Dont see how you could ever drop them though? Nothing else has that kind of punch per pt (in the game possibly), sure they may die but if theyve just killed most of a unit of Demi's is that really a problem?